The smart weapons market is projected to grow from USD 11.52 Billion in 2016 to USD 15.64 Billion by 2021, at a CAGR of 6.3% during the period under consideration. This report covers the forecast of the smart weapons market and its dynamics over the next five years, while also recognizing market application gaps, recent developments in the market, and high potential countries. The market has been analyzed primarily on the basis of product (including missiles, munitions, guided projectiles, guided rockets and precision guided firearms) during the forecast period, considering 2015 as the base year. Market size estimations for various segments and subsegments of this market were arrived at through extensive secondary research and government sources, such as the U.S. Department of Defense (DoD), the U.S. Air Force website, company website, corporate filings, such as annual reports, investor presentations, and financial statements, and trade, business, and professional associations, among others. orroboration with primaries and further market triangulation with the help of statistical techniques using econometric tools were carried out. All percentage shares, splits, and breakdowns were determined using secondary sources and verified through primary sources. All possible parameters that affect the market covered in this research study have been accounted for, viewed in extensive detail, verified through primary research, and analyzed to get the final quantitative and qualitative data. This data is consolidated and added with detailed inputs and analysis from MarketsandMarkets, and presented in this report. The ecosystem of the smart weapons market comprises manufacturers, distributors, and end users. The key end user of the market is the defense sector. Technology providers smart weapons are Raytheon Company (U.S.), Israel Aerospace Industries (Israel. ), L-3 Communications Ltd (U.S.), and Northrop Grumman Corporation (U.S.), among others. Key manufacturers of smart weapons are Lockheed Martin (U.S.), MBDA, Inc. (U.K.), Orbital ATK (U.S.), General Dynamics Corporation (U.S.), BAE Systems (U.K.), The Boeing Co. (U.S.), and Textron, Inc. (U.S.) among others. The smart weapons market is projected to grow from USD 11.52 Billion in 2016 to USD 15.64 Billion by 2021, at a CAGR of 6.3% during the forecast period. Factors, such as armed conflicts, terror activities, cross-border disputes, and increasing military use of smart weapons are expected to fuel the growth of the smart weapons market during the forecast period. On the basis of product, the given market has been segmented into missiles, munitions, guided projectiles, guided rockets, and precision guided firearms. The munitions segment is projected to grow at the highest CAGR during the forecast period. Rising demand for smart weapons can be attributed to several factors, including use of smart weapons for tactical operations, rising territorial disputes, increasing need of precision munitions, among others. Procurement of smart weapons by the defense sector has increased considerably in the past few years, mainly driven by increase in terrorist activities globally, especially in North America and Europe. Smart weapons with laser and infrared technologies are being procured in huge number. On the basis of technology, the infrared segment is expected to lead the overall smart weapons market in 2016. The laser segment is anticipated to grow at the highest rate in the coming years. This can be attributed to the rising demand for technologically advanced autonomous weapons. The land segment dominates the smart weapons market, by platform. The land segment includes guided weapons, which are launched from main battle tanks, artillery, shoulder fired weapons, and precision firearms among others. The land segment is expected to grow at the highest rate during the forecast period. This can be attributed to the increasing demand for anti-tank missile systems by the U.S. government, which serves as a key driver for the growth of the land segment of the market, by platform. The U.S. Department of Defense (DoD) is currently developing the Joint Air-to-Ground Missile (JAGM), which will replace the Hellfire family of missiles. JAGM provides advanced line-of-sight and beyond-line-of-sight capabilities, including precision point and fire-and-forget (active and passive) seeker targeting technologies, increased range, and increased lethality against soft and hard, moving and stationary targets. 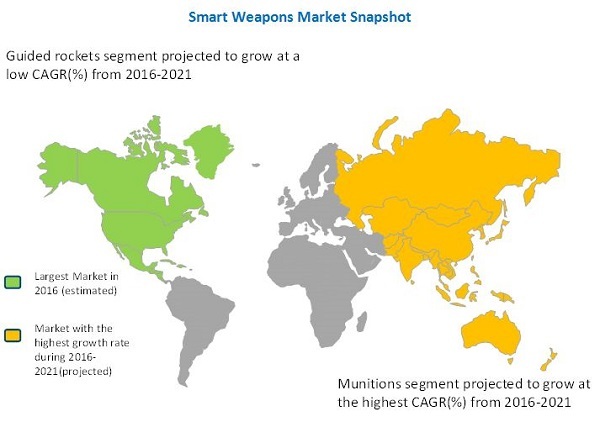 The North America region is expected to witness highest growth in the smart weapons market during the forecast period. Need to counter rising terrorist activities and various military equipment modernization programs are the key factors driving the market in North America. The growth of the smart weapons market could, however, be affected by certain major restraints in the coming years. These factors include declining defense budgets of developed economies of the world, such as the U.S., Canada, the U.K., Germany, and stringent arms transfer rules and regulation laid down for the defense industry. In several countries, munition manufacturers are prohibited from exporting their products, thereby decreasing their chances of catering to the requirements of international customers. Key players operating in the market are Lockheed Martin (U.S.), Raytheon Company (U.S.), MBDA, Inc. (U.K.), General Dynamics Corporation (U.S.), and Orbital ATK (U.S.). Contracts and acquisitions are the major growth strategies adopted by the top players to strengthen their position in the smart weapons market.